Ghent (/ɡɛnt/; Dutch: Gent pronounced [ɣɛnt] ( listen); French: Gand pronounced [ɡɑ̃] ( listen); German: Gent pronounced [ˈɡɛnt] ( listen)) is a city and a municipality in the Flemish Region of Belgium. 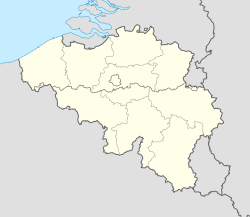 It is the capital and largest city of the East Flanders province and after Antwerp the largest municipality of Belgium. 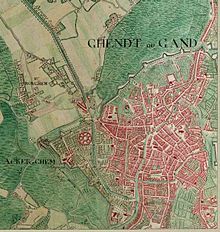 The city started as a settlement at the confluence of the Rivers Scheldt and Leie and in the Late Middle Ages became one of the largest and richest cities of northern Europe, with some 50,000 people in 1300. It is a port and university city. Much of the city's medieval architecture remains intact and is remarkably well preserved and restored. Its centre is the largest carfree area in Belgium. Highlights are the Saint Bavo Cathedral with the Ghent Altarpiece, the belfry, the Gravensteen castle, and the splendid architecture along the old Graslei harbour. Ghent has established a blend between comfort of living and history; it is not a city-museum. The city of Ghent also houses three béguinages and numerous churches including Saint-Jacob's church, Saint-Nicolas' church, Saint Michael's church and St. Stefanus. As one of the largest cities in Belgium, Ghent has a highly developed transport system. The transport destinations you may need to use in order to reach the conference site, depending on your point of arrival and/or lodgings, are highlighted in red below. Ghent lies some 40 km to the west of the airport of Brussels and some 70 kms from Charleroi-(Brussels South Airport) if you fly Ryanair. See below how to get reach Ghent from these different airports. From Brussels Airport for Gent St Pieters Station: A shuttle bus departs every 30 minutes and is €15,50 per person per trip. Taxi: It's a 55 minutes trip and will cost around €90. 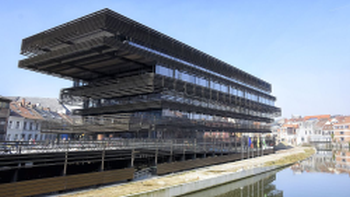 Please note that de Krook is located in an area restricted to traffic and needs to be accessed via the Ring Road as the city center does not admit through traffic. Parking: Underground Public Parking is located at the end of the B401 Exit road of the E17 Motorway. This is located some 200m South East of de Krook. From Germany see the German Railway Information Site and also check the information on the ICE train from Cologne to Brussels. From London see the EUROSTAR Information Site for information on trains between London and Brussels. From Paris see the THALYS Information Site for information on trains between Paris and Brussels. From Amsterdam see the THALYS Information Site for information on trains between Amsterdam (Shiphol Airport) and Brussels. If you take this train then you can also change trains in Antwerp and take the Ostend or Lille bound trains to reach Ghent St.Pieters station. More information about timetables of trains in Belgium. International buses connecting Ghent to other European destinations are usually found at the Dampoort Station. A couple of private bus companies such as Eurolines and Flixbus operate from the Dampoort bus hub.